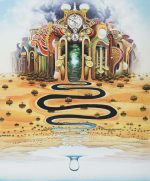 All works of Mr Yerka do not require payable export license when sending out of Poland. We ship unframed giclees in a carton tube by registered post package (Pocztex) . For framed works we ensure proper and safe packing in carton boxes with bubble wrap and foam fillings and use Pocztex or Fedex courrier service . Fedex is more expensive, but rather recommended to items with glass and frame because their service is quicker and seems more reliable. For destinations in Poland we provide free shipping !